Marked cards and loaded dice - Gambling is big business. Each year billions of dollars are spent on gambling in all forms. Hustlers take the lion's share of this money... possibly some of it is your money. 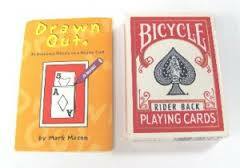 At least 100,000 decks of marked cards and an equal number of loaded dice and accessory equipment are manufactured in the U.S. every year by companies who claim these products are merely for "entertainment purposes" or for use by magicians only. Needs 4 batteries - uses L1174 - about $3.00 per dozen on ebay. A hard spectacle case is shown, it has a random eye chart printed on one side (just like an opticians) and is completely plain on the other. 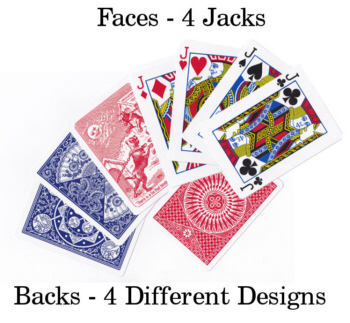 A card is selected from a regular deck. You now remove your invisible mind reading glasses from the spectacle case. After a couple of minutes by play with invisible glasses and you guessing the card wrong several times. The spectator is asked to read the eye chart on the case. it now reads THE CARD YOU SELECTED IS THE. The World's leading magicians, creators and historians have heralded David Penn's Mystery Solved as "The Holy Grail". In any lighting conditions, close-up, walk around, parlour or stage you will be able to perform the cleanest and clearest switch ever!!!!! A killer ending for card to impossible location. 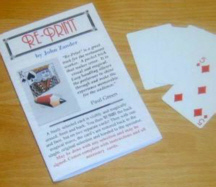 The perfect solution to the dream card plot The most direct and fair Confabulation routine you have ever seen.Mystery Solved has been perfectly engineered and custom made from the ground up, to provide you with a method that you will enjoy using again and again and yet your spectators will never see a thing! As Marc Oberon Said - "When I saw Mystery Solved I couldn't believe a switch was occurring". Utilize Mystery Solved as your finale, in the cleanest and clearest card to box ever, or to reveal a prediction. A signed card vanishes from the deck only to be discovered in the clear box that has been isolated under a wine glass the entire time! In a mentalism routine your audience can see you place the prediction inside an empty box. Martin Lewis' classic effect is still used by magicians everywhere after more than 30 years! This is in three phases. The first two are similar, but with variations in handling. The third phase has an unexpected "knock-out" finale. 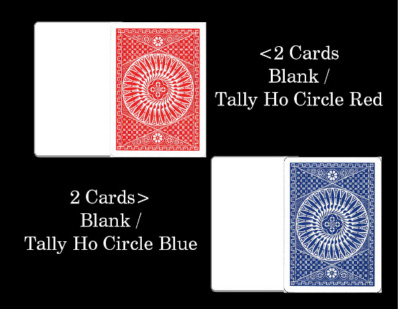 In the first two phases, three blank cards and an ace are shown. 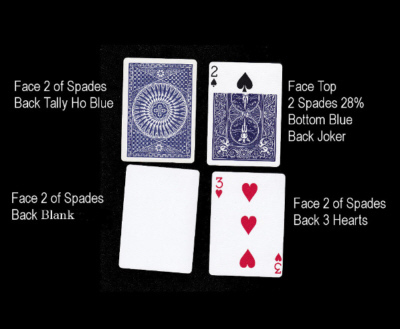 A blank is placed aside face down, and the ace put between the other two blanks. 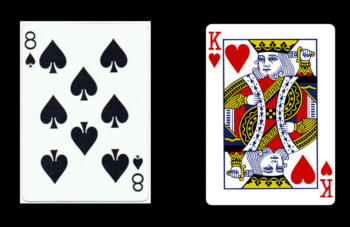 A spectator fails to find the ace because the three cards are shown one by one to be blank, and the ace is on the table. A signed card is clearly torn into two pieces. With both pieces signed, one of them is inverted and the card is then visually restored in an impossible twisted state. All this happens whilst the spectator is holding the card. Quite simply it is Torn, Twisted and Restored! This leaves the spectator with an incredible souvenir that they will keep and talk about forever. The effect can be straight and to the point or you can use an 'Anniversary Waltz' style presentation. A full erformance can be seen on the trailer and it really is that direct and clean, with no angle problems. Masterpiece by Rick Lax (Download + 26 Cards) A true miracle. No deck, no distractions, no sleight-of-hand. Just pure MAGIC. ONE card - that's it. 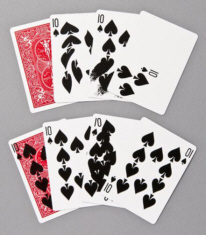 You pull out a single card and ask your friend to name a number between one and ten. It's truly a FREE CHOICE. Then she decides on a suit. You tear up the ONE card (that's been in full view the whole time) and shown the torn pieces. Wow 2.0 truly looks like trick photography. This is the strongest, most visible, and most practical ending to any Ambitious Card routine ever! Imagine at the end of your favorite Ambitious Card Routine, you offer to "magician-proof" the deck to create an impossible condition. 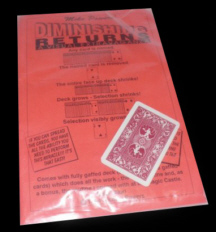 A translucent piece of plastic is placed on top of the ordinary face-down deck to isolate the cards and preclude the magician from any "tricky business." 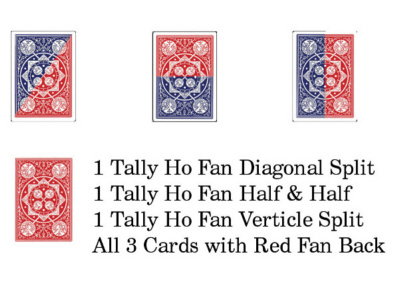 The selected card is signed by multiple spectators to avoid the thought of a confederate. The signed card is placed FACE UP into the center of the face-down deck. This is all rubber banded together so the magician cannot do any sleight of hand. Finally, the deck is placed onto a Spectators palm-up hand. What happens next is nothing short of a miracle... The audience Sees the Face Up signed card Slowly and Visibly rise through the face-down deck. It slowly and visibly appears on top of the face-down deck. There are no trick decks, no trick cards, no difficult handling - as close to real magic as you can get. The spectators will scream in amazement. Many top magicians such as David Blaine, Paul Harris, Dean Dill, David Penn, and others have raved about this trick. You will Love Wow 2.0 and you will use it. A selected card suddenly and inexplicably becomes perforated with countless holes. Then, in the blink of an eye, all the holes vanish, but they have to go somewhere, don't they?... Upon examining the deck, one large hole is now seen to be running right through its center! This is truly a reputation-maker! It resets easily, there are no difficult sleights, and everything takes place in the hands, so it's perfect for walkaround work! This diabolical effect is one of magic's all time best-sellers. 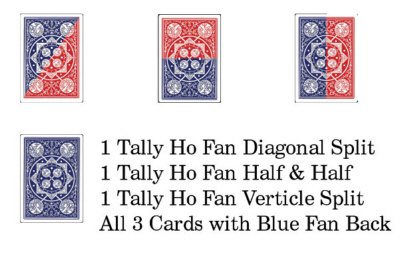 Performer displays two packets of four face-down cards. 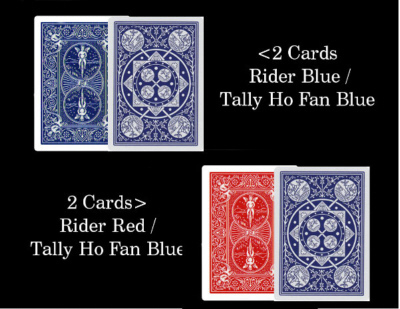 One packet is red-backed and the other is blue-backed. 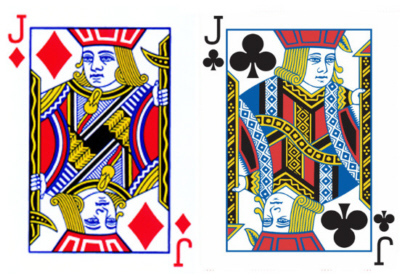 The spectator selects a packet and is asked to imagine that his packet consists of four face-down queens. He then thinks of any one of the four queens. 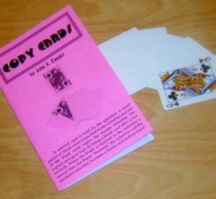 Performer displays the fronts and backs of a deck of cards to the audience. A spectator simply names any card they like, you remove the named card and set it aside face-up. You now spread the deck on the table and somehow the entire deck visibly shrinks to half of its original size! 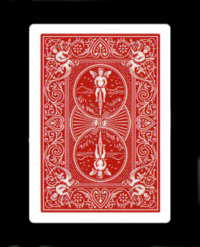 The selected card is the biggest one in the deck. Just when the audience catches their breath, the entire deck grows back to its normal size, and now the selected card has shrunk! As a finale... the selected card visibly grows back to normal size! 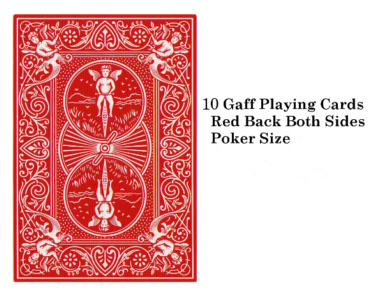 Includes a very special deck, printed on Bicycle stock and a 6 x 9 booklet of detailed instructions. 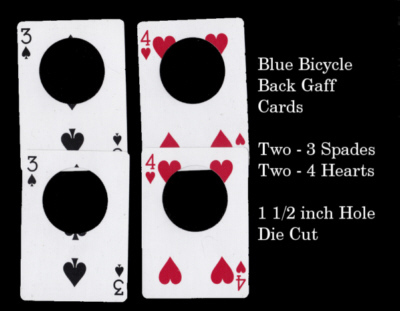 3 OF SPADES AND 4 OF HEARTS - WITH 1 1/2 INCH DIE CUT HOLE - (2 OF EACH CARD) - Note: These are the gaff cards only - No instructions. 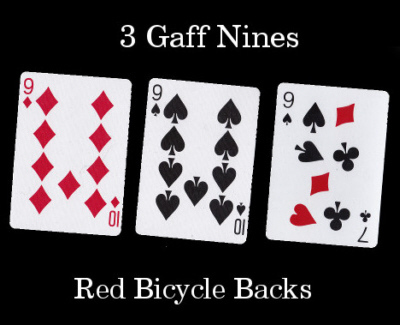 CD52560 GAFF CARDS - BLAINE MONTE EIGHT HEARTS/KING SPADES - 4 Cards For Blaine Monte - (King Spades / 8 Hearts - Red Back Bicycle) - Includes: Clear hard Plastic Storage Case - Note: These are the gaff cards only - No instructions. 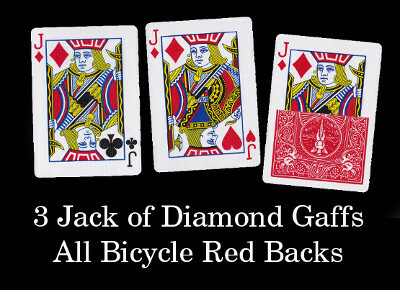 CD52559 GAFF CARDS - BLAINE MONTE KING HEARTS / 8 SPADES - 4 Cards For Blaine Monte - (King Hearts / 8 Spades - Red Back Bicycle) - Includes: Clear hard Plastic Storage Case. 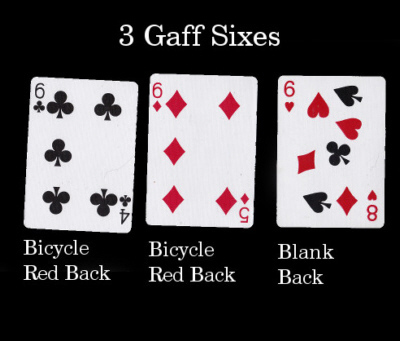 Note: These are the gaff cards only - No instructions. 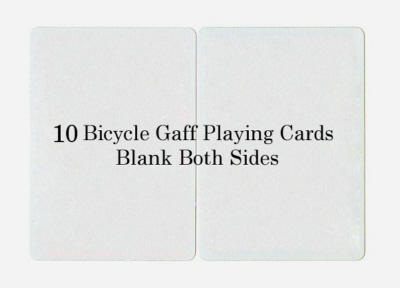 Includes: Clear Hard Plastic Storage Case - Note: These are the gaff cards only - No instructions. Unlike the usual stripper deck that has the cards cut on the long side this deck has them cut on the short end. Works the same as a regular long side cut deck except on the short end of the deck. This is a professional steel shim card, made from 2 card splits in order to keep the card from becoming too thick. There are no wrinkles or tell tale signs of a modified card on the face or back. The two split half cards are perfectly aligned, so that no trimming or shortening of the card is necessary. 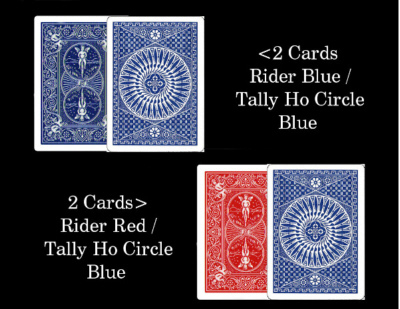 CD52538 BLUE BICYCLE PROFESSIONAL SHORT CARDS (SET OF 4) (4 random number cards - one each suit) - Most short cards have a very wide corner rounding that is quite noticeable and unacceptable to card workers. 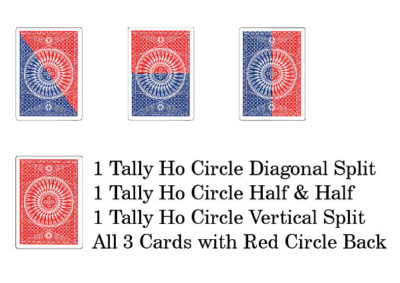 Each of these short cards have been rounded to a 1/8 th inch corner radius. 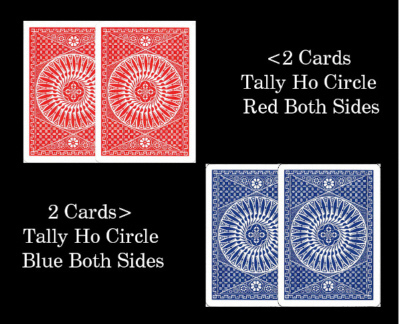 A 1/8 th inch radius cut is the preferred option for professional card workers. A short card (or cards) can be inserted into a regular matching red bicycle deck and used as a key card. Great for locating cards or for many cutting type effects. 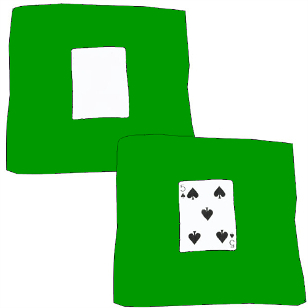 (4 random number cards - one each suit) - Most short cards have a very wide corner rounding that is quite noticeable and unacceptable to card workers. Each of these short cards have been rounded to a 1/8 th inch corner radius. 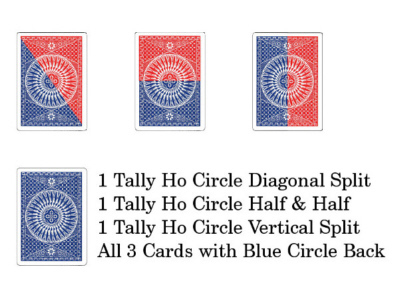 A 1/8 th inch radius cut is the preferred option for professional card workers. 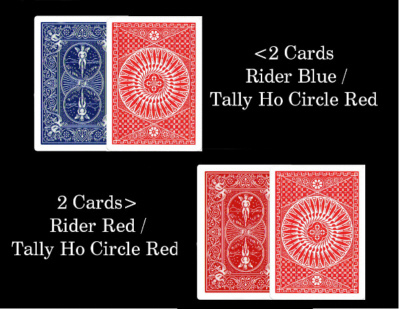 A short card (or cards) can be inserted into a regular matching red bicycle deck and used as a key card. Great for locating cards or for many cutting type effects. A spectator selects a card, and returns it to the deck. Another card is taken from the deck, and inserted at the middle of the deck from the side. When the card comes out from the other side of the deck, it is changed to the card that the spectator has selected! Comes complete with gimmick and detailed instruction sheet in English and Japanese. 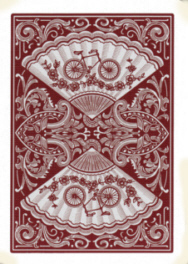 (Bicycle gimmick cards) - A selected card is held by the spectator, a smal packet of blank cards is touched to the selection and one of the blank cards copies the "unseen" selection. The copied card, after a few seconds again becomes blank. 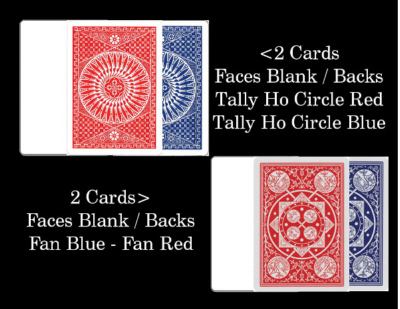 When the blank is touched to the "unseen" selection a second timethe blank becomes the selection and the spectators selection becomes the blank card in their hand. The spectators reactions are priceless. 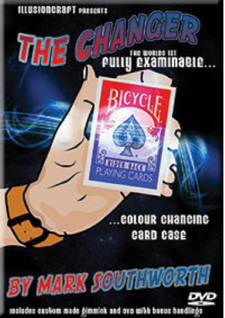 (Bicycle gimmick cards) - A selected card is held by the spectator, a small packet of blank cards is touched to the selection and one of the blank cards copies the "unseen" selection. The copied card, after a few seconds again becomes blank. 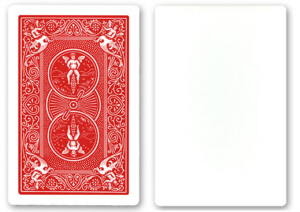 When the blank is touched to the "unseen" selection a second timethe blank becomes the selection and the spectators selection becomes the blank card in their hand. The spectators reactions are priceless. 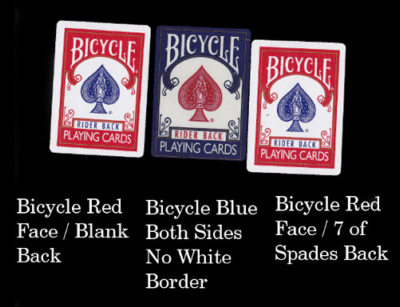 Includes: instruction sheet, and two specially printed, official US Playing Card Company Bicycle tuck cases (one red and one blue). A card is selected and returned to the deck. The cards are shuffled and the magician, very confidently attempts to find the chosen card! After a few failed attempts, he asks the spectator the name of their card. "The Queen of Hearts," the spectator declares. "Really," the magician responds, "that's strange because that is exactly how much I paid for this deck!" 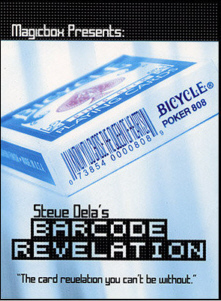 The spectator looks confused, and the performer picks up the card case and instructs them to look at the barcode. It reads, "I KNOW YOU CHOSE THE QUEEN OF HEARTS!" Wow 2.0 is the most visible and amazing card change ever. It happens slowly and right before your eyes. 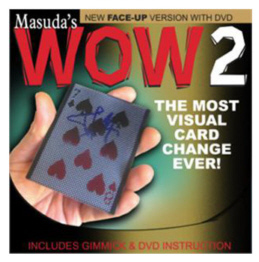 Wow 2.0 is hailed by magicians around the world as one of the most amazing card effects they have ever seen. This looks like real trick photography but happens right before their eyes. A card is selected, signed, and lost in the deck. A random card is removed and fails to be the chosen card. This random card is inserted in a plastic sleeve to isolate it and avoid any chance of tricky sleight of hand. The card "Slowly and Visibly" changes to the signed selection. You will be blown away by how amazing this looks. After seeing this trick, Lance Burton simply said, "WOW!" He was at a loss for words.Wow 2.0 (Face Up) now includes the gimmick and detailed instructional DVD. As a bonus, world renowned trade show performer Paul Gertner contributes an amazing effect where the magic moment is captured forever on a spectator's phone - a souvenir they will talk about long after it is over. Wow 2.0 is one of the most amazing pieces of magic you will ever do. Easy, visual and stunning you will do it just to amuse yourself and marvel at its effect. Includes: instructional DVD and Face Up Wow 2.0 gimmick. (Blue Back Bicycle) - Random House Unabridged Dictionary defines Lollapalooza as: a noun, Slang. An extraordinary or unusual thing, person, or event; an exceptional example or instance. Includes 3 routines with contributions from Jon Armstrong, and inspirations from Darwin Ortiz and R. Paul Wilson. 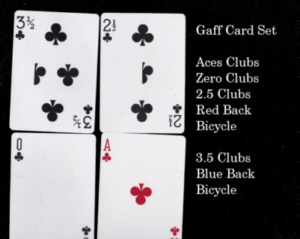 You will learn a 10-Card Poker Deal that is the fairest one of 'em all! A Spectator-Cuts-The-Cards where the spectator ends up with an impossible hand of cards. An incredible Poker Demonstration involving a spectator choosing any 10 cards in an attempt to beat the dealer! No forcing, or sleight-of-hand required. Includes: Full patter for all routines, Specially printed cards from U.S. 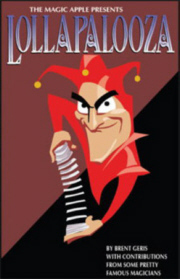 Playing Card Company, Custom Sticker for card box. 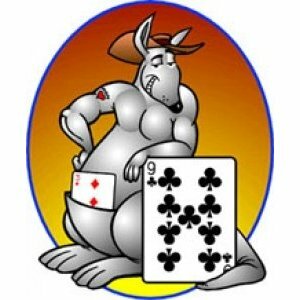 David Solomon has created the poker deal to beat all poker deals! 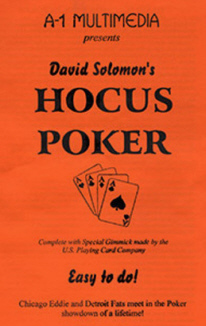 Hocus Poker is an ingenious "contest" staged at world famous "Cheater's Convention." In the finals, Chicago Eddie and Detroit Fats are each dealt a hand of aces and eights, the "Dead Man's Hand"! Each player then gets a shot at cheating. Eddie secretly steals two aces from Fats, giving him four aces. Fats then shows his hand to be a straight flush, showing each card front and back! Eddie, not to be outdone, changes his hand into a royal flush to win the competition. Beautiful 18 silks. 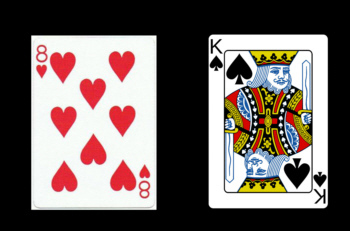 One blank; one showing King of Hearts. Includes instructional DVD by Juan Tamariz. A funny and new Lie Detector routine! A new and baffling approach to the Lie Detector effect that is ever so easy to do. 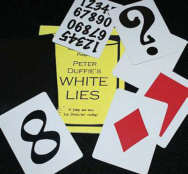 Magic at its best from Scotlands favorite Peter Duffie. A card is selected and a special Lie Detector is introduced. The magician asks questions and the spectator can either lie or tell the truth. The Lie Detector gradually reveals the selected card. An incredibly commercial effect! Complete with special cards. Lots of magic, and entertainment in a small packet of cards. Performerselects a volunteer to help with an amazing thought transference experiment. 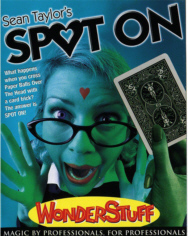 The spectator chooses a card and concentrates on it. Remarkably, another spectator is immediately able to name the card! This is a wacky and fun mind reading effect where every other spectator except the not so willing volunteer is staring straight at the method! 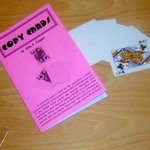 Includes a supply of specially printed gimmicks with a myriad of uses. Easy To Do Photo Illustrated Instructions Custom Made Gimmicks. You'll Perform Tag for the rest of you life NOW COMES WITH AN INSTRUCTIONAL DVD. 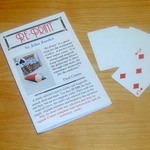 Have any card freely selected, signed and returned into the deck. Magician then removes any card from the deck. A GENUINE hole is punched through the incorrect card. Next a tag is passed through the hole and tied so the card is fastened to the tag, NO FAKE TAGS etc. IMPOSSIBLE Magic! The hit of the MAGIC-LIVE dealers room. This electronic hand built unit, allows you to create the perfect signed card, to card case. The E CASE utilizes a brand new method, that's hip cool and up to date. Take a trip with Mark Mason, as the training DVD takes you step by step through every detail. 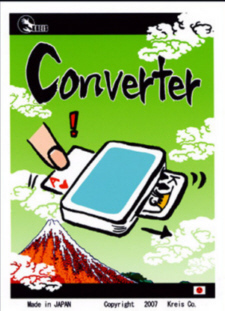 You will love the creative method, the ease, yet quite ingenious device that you simply slide inside any regular card case. 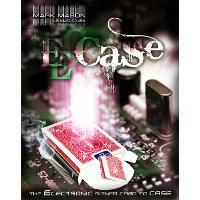 The E Case gives you all the tools required to perform this classic of magic. Two great El Duco Wallets combined, to make a Super Wallet. Many of us do both Stand Up Shows and Table Hopping. 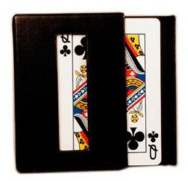 This wallet is designed to be used under all type of conditions: If you do a stage show you use the ingenious, bold and simple Signed Card to Sealed Envelope in Wallet in Zipper Compartment principle in this smart version of the LePaul/Seabrooke Wallet. If you do walk-around-magic or table hopping, the setup with the envelope might be too tedious. Then you can use the Signed Card to Wallet in Zippered Compartment option instead, because this wallet is also a Kaps Wallet, with our own very special "invisible" gimmick. When you use the latter option there is no setup at all. A freely chosen card is signed and replaced in the deck which is shuffled. You try to name the card and mention different ones - but they are all wrong. Finally you ask for a last chance as you place your wallet on the table. If i miss this time, the content of my wallet is yours!. But you fail again! Now you seem disturbed. Made of real leather in Europe exclusively for FUN Incorporated. Magician removes a card from the deck and shows it to the spectators. They confirm that this is NOT the card they previously selected. The magician offers to fix the problem. He places the card into an attractive card case. As he does so, the card instantly and visibly changes into the selected card! CD49975 SHATTERED - The magician strikes a selected playing card and the ink shatters like a broken mirror! The shattered card is then handed out for examination. CD49970 PRESTO PRINTO - WITH PRINTED INSTRUCTIONS -Daryl's own unique contribution to the "Wild Card" effect. This electrifying classic of magic can now be performed with no sleight of hand! Wild and crazy designs are magically "printed" on previously blank cards - includes mirror images, smudged cards and fallen pips to name a few! Very easy to do and everything can be examined! During an enertaining routine with blank cards a spectators selected card becomes a blank card right in their own hand. 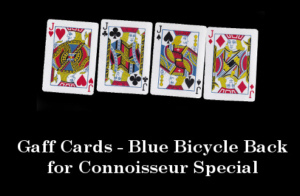 Ever wished you could perform seemingly impossible card tricks, but you don't have the skill? Well, your Card-Worker's Dream is NOW possible with Switch-A-Roo, the ingenius card-switching device that works right in your pocket! And you don't need sleight of hand to use this gimmick! It's a simple idea: use Switch-A-Roo to switch regular cards for any other cards, in one simple motion! Wow, does this open up the possibilities! Secretly switch a card for a signed card. Secretly switch any card for one that was previously selected and vanished. Secretly switch a regular card for a gimmicked card, and use that gimmicked card to perform an impossible card effect! Secretly switch a gimmicked card for a regular card, so that you can let your spectator "examine" the card! 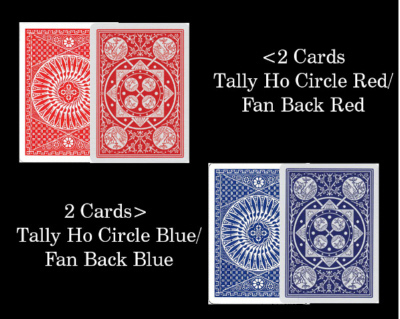 End your packet tricks cleanly, with no telltale gimmicked card left at the end. Oh, the possibilities are ENDLESS! 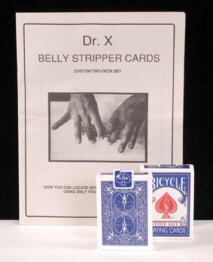 A two pack set of Belly Stripper decks. Dr. X, Duluth MN, ca. 1999. 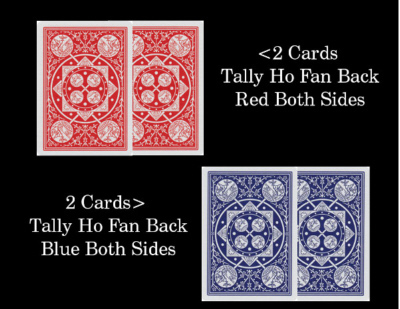 One positive and one negative deck, with instructions for their use.